The killing of Aboud Rogo, a controversial Muslim cleric, on August 27, 2012, caused riots and unrest in Mombasa, a coastal city and a main tourist destination in Kenya. These riots, which started on August 27, 2012 and continued until August 30, 2012, saw more than ten casualties. Following the killing of Rogo and the subsequent riots, netizens took to their blogs and Twitter to discuss issues such as extra judicial killings, human rights, religious tensions and lack of employment opportunities fueling anger among the Kenyan youth in Mombasa. More images from Mombasa can be found here. Aboud Rogo Mohammed was suspected of being a key recruiter for Kenyan Muslims fighting in Somalia. It is not known who shot him, but he was on a United Nations sanctions list for allegedly financing the militant Somali group al-Shabab. The killing on Monday of Aboud Rogo fits into a pattern of extrajudicial killings and forced disappearances of suspected terrorists that is allegedly being orchestrated by Kenyan police, say Kenyan human rights groups… He is the fifth alleged Muslim extremist who has been killed or who disappeared in the last four months, according to human rights campaigners. One corpse was found mutilated and the other four men vanished. Hassan Omar Hassan, a former deputy head of the government-funded, Kenya National Commission on Human Rights, said police had used the strategy of eliminating suspects before. In a 2008 report, the commission said Kenyan police were to blame for the executions and disappearances of more than 500 people who were suspected of being members of a notorious gang during a crackdown on the gang from June-October 2007. The police on their part denied any role in the killing and have hinted at the possibility of Rogo having been assassinated either by his rivals or by the members of al-Shabab, the latter possibly having done it to gain sympathy and “galvanise support” among the Muslim youth in Mombasa. Others linked the rioting and unrest to grievances over land ownership and growing frustration and anger among the youth in Mombasa, given the lack of employment opportunities. The violence could worsen if it taps into long-standing local grievances over land ownership and unemployment, as well as calls by the Mombasa Republican Council (MRC) for the coastal strip to secede. 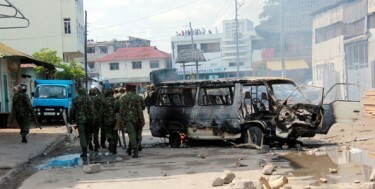 The MRC said it was not involved in the unrest. Maria (@MariaOC): “#Rogo #MombasaRiots GOK had you given idle youth some employment then they wouldn’t be masquerading and threatening innocent people aaargh! Terryanne chebet (@TerryanneChebet):Youth causing Mayhem in Mombasa have nothing to loose, if young people are economically empowered, then perhaps this wouldnt have happened. This move was appreciated by netizens who tweeted their approval of this act of interfaith unity and hoped that this would usher in a better and peaceful coexistence of the two religious communities in Mombasa. Rogo is the fifth alleged Islamic radical killed in Kenya in 2012. Apart from religious tensions between Muslims and the government in Mombasa, a Mombasa-based separatist group called the Mombasa Republican Council is calling for cessation from Kenya claiming that the Kenyan central government has not done enough to develop the coast. This article was originally published on Ephraim’s professional page on Global Voices Online.